In his review of the Yaesu FTDX5000 in the June 2010 issue of RadCom, Peter Hart G3SJX criticizes Yaesu for not providing a USB interface as Icom does with its IC7600 transceiver. This same criticism is frequently made by new users or prospective users of the Elecraft K3. I think it is an extremely shortsighted view and I'm surprised to hear it from someone of G3SJX's experience. This seems to be another example of the "it's newer technology so it must be better" attitude that seems to be taking root in the hobby. The RS-232 serial port has been around since long before the personal computer. It has not been used for "consumer" equipment since the days when printers and modems came with a serial interface, which is why RS-232 ports are no longer provided with new PCs. But it is nonsense to claim that RS-232 is obsolete because of this. Adding a couple of serial ports to a PC is simply a matter of opening the case and slotting in an RS-232 board. Granted, it isn't as easy if you are using a laptop, which is why RS-232 to USB adapters exist. But expandable desktop or tower PCs have so many advantages that why anyone would choose to use a laptop for their shack computer beats me. Icom uses USB not just for computer control but also for audio so the IC7600 doesn't need the sound card and requires only a single cable to connect it with the PC. This is an innovation that has obvious marketing appeal - which is no doubt why Icom included it. But it's a benefit that can only be enjoyed by users of specific versions of Windows. If you use Linux, Mac OS, Windows 2000 or earlier or Windows XP 64-bit you're out of luck. RS-232 on the other hand is supported natively by just about any computer running any OS, by microcontrollers and even by non-computer devices like Ethernet serial port servers. It offers far more choices, even if most of those choices are only of interest to a minority of users. Buy a device with USB and you are dependent for its continued usability on the willingness of its manufacturer to develop drivers for as yet unreleased operating systems. I've had to junk perfectly good printers and scanners in the past because the latest drivers were for Windows 98 or Windows 2000 and the manufacturer did not produce any for Windows XP. Most radios have a life of 20 or 30 years, considerably longer than most computer hardware, so designing into them an interface that itself may have been replaced by something faster and better in the PCs of 10 or 15 years time seems to me very shortsighted. Icom chose to provide a Windows-only supported USB interface on the IC7600 for purely marketing reasons. Elecraft arguably made the best decision with the K3 by not just providing a true RS-232 interface (not a lame TTL version requiring an extra-cost level converting cable) but also making the DTR and RTS signals optionally usable for PTT control and CW keying. Although separate audio cables and use of a sound card are needed, Elecraft included isolating transformers so no separate interface (RigBlaster etc.) is needed. If Yaesu chose to emulate this aspect of the K3 design as well then it should be commended not criticized. But expandable desktop or tower PCs have so many advantages that why anyone would choose to use a laptop for their shack computer beats me. RF Shielding of laptops are typically better than what is found in desktop/tower PCs, especially those that are home built from components. Shorter, or the elimination, or cabling from display, keyboard, and mouse can reduce possible sources of RFI. In smaller shack setups, the computer also has to share duty for everyday computing, as well as be shared with other household members. The ability to easily move the computer in/out of the operating position can be a plus. Having one computer for both shack and portable operations can be useful to keep a similar, up to date operating environment. No need to install and configure applications twice, keep logbook data sync'ed and current across multiple machines, etc. I use laptop's as shack computers for the same reasons Fred outlines. Well - you say it's a shortsighted view Julian, but as I'm sure you know USB interfaces have them selves been around for well over 15 years now - and is pretty much the mainstream in PC connectivity. So I think it is a fair critisism to make, that Yeasu's Top of the Range "Flagship" model does not have it. After all - how much would it have cost them to include it? From what I can see, this radio and I suspect pretty much every mainstream rig from now on - is likely to be nothing more than SDR with a bespoke software and a mechanical interface bolted on to make it into what we would recognise as a "rig". So if we are to use computers as radios - they may as well have USB interfaces on them. Expanding on Rickyscouts comment: You can plug a whitebox generic mouse or keyboard into just about any Windows or Linux machine and they work with no drivers. There's no reason the radio manufacturers can't agree on an open standard for basic radio control and audio/IF monitoring. In this way any rig could be connected to any PC and have a high probability of functionality without drivers. I think G4ILO is throwing the baby out with the bath water by saying no USB. USB's superior bandwidth is too rich to give up. The forward-looking solution is to get ICOM to stop using closed proprietary drivers and to get Yaesu/ICOM/Elecraft etc to adopt an open industry standard. Hmm. I think getting competitive radio manufacturers to adopt a common open standard might be wishful thinking. Perhaps it will happen in the SDR arena where the USB bandwidth is really needed and where amateurs rather than commercial manufacturers are setting many of the standards. The reason USB keyboards and mice work with no drivers is they are supported by the hardware. I don't think it's likely that a ham radio interface would be supported natively as it is just too specialized. The fact that Icom only supports Windows now suggests to me that it is more likely to follow the path of consumer USB hardware manufacturers and support only the OS with the biggest market share for no more than the life of the product. Radios have a lifespan longer than operating systems and I suspect that the IC7600's USB port will be a useless accoutrement with no driver support in 10 - 15 years time while my K3's serial port and audio cables will still be usable. 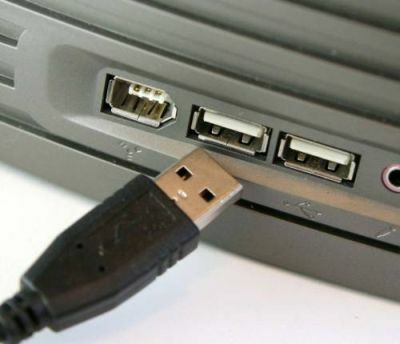 USB is itself evolving, now with USB3.0 being the latest rage. I totally agree with Julian. Anything can interface with Serial (RS232C) as it is simple and flexible. Anybody can figure out RS232C operation, how many of the USB fan boys know how USB really works? I can guess, very few. You can diagnose a serial port problem with a few resistors and LED's, USB - forget it. I don't agree with Julian on laptops though, as apart from if you are a gamer where you can get much more computer for your money, and upgrade it easily, laptops are a good general purpose solution. If you select wisely laptops can also be quieter, RF wise, due to fewer external cables. However, laptops - towers really is a small difference in the end. I exclusively use laptops without serial ports, whats the problem? I have a cheap USB to Serial adaptor, which works with all my gear, and I know where to go if I have a driver problem. Getting a new OS which does not support that USB-serial dongle? Buy another dongle, not a new radio. Good luck trying to get any sense out of a radio manufacturer, who will most likely deny it is their problem. It seems a portion of the Ham population is confusing technological progress with marketing hype. This march by those individuals into an arena where they don't understand the technologies they are using has a name - consumers. Is that what Ham radio progress is? Julian makes a very powerful observation in the dropping of support for certain technologies. What may seem a blessing today, may turn into a curse tomorrow. USB isn't marketing hype. It's a ubiquitous standard that's not new and is common as dirt. It's actually somewhat embarrassing that ham radio is probably the last consumer technology to finally get around to having USB. My TV's got USB. My car has them. Heck, even my toaster has one. Serial ports are obsolete -- try and buy a laptop or even a desktop with one. USB 3.0 will actually be nice for ham radio. It uses a fiber optic cable and thus will be immune to RF in the shack. I don't share the fears that radios will stop working because new drivers aren't released. USB can be reverse engineered, and there's a lot of talented hams out there that can share solutions. Already I'm reading in forums that the ICOM USB radios are being used under Linux even though ICOM has not released a driver for Linux. Serial ports are not obsolete. They are still used in industry, labs and hospitals to interface with various types of equipment. The fact that you can't buy a desktop with a serial port is of no consequence as you can easily buy a plug-in card to provide 1, 2 or 4 real serial ports which is exactly what I did. Since everyone seems to prefer laptops I think I must say a few words on why I prefer desktops. I do use a laptop for work and I also have a netbook because portability is an advantage there and they don't need to be tethered to radios, a printer or anything else. But the keyboards are awful whilst a desktop allows you to use a keyboard and a monitor of your choice. My experience is not that laptops are better RF shielded than desktops, but I have only used quality PCs like my present HP mini tower which is impressively well screened. I have also found a lot of USB equipment such as multi port hubs - which you will likely need with a laptop that typically has only 3 USB ports - to be a source of RFI. Besides the ability to install real serial ports another benefit of a desktop or tower PC in the shack is the ability to install multiple sound cards which is an inexpensive way to interface to multiple radios and still have computer sound. I have yet to find a cheap USB sound card that is good enough for ham radio use. The cheap USB audio dongles appear to resample to a low sample rate with the result that weak signals are lost. Check out this, I like it. USB-RS232 converter with free drivers for Windows/MacOSX/Linux. You can even replace a existing RS232-connection. There has been a lot of discussion about this device. In fact that was one of the things that prompted me to post on this topic. To my mind that just gives you the worst of both worlds. It's still just a serial interface with the limitations that has, but now it can no longer be accessed using RS-232 by those who would want to do that. So it closes off an option just for the sake of avoiding the need for an external USB to RS-232 converter. Moreover, if the particular USB implementation has driver / compatibility issues with a user's computer, they can't just try a different converter with a different chipset. You've got to have a cable anyway, so what's wrong with doing the USB conversion in the plug rather than the socket?